Good news regarding our Blog’s post from the 26 January 2013 about DMCA Ruling (Only for Customers from USA). 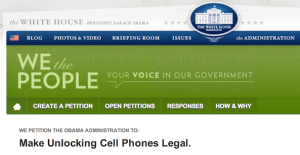 The Petition hit before the deadline the 100k signatures and the answer from the White House was to Pushes for Cell Phone Unlocking to be Made Legal. However if you’re a seller from the USA and want to be sure that the Bill to legalize cell phone unlocking not ONLY concern consumers but also business providing this service, here is a letter we suggest you to send to Senator Amy Klobuchar before she finish to draft the bill. I commend you for standing up for consumer rights and the free market. I also have some concerns that I would appreciate having you consider while writing this legislation. Please be sure to include wording that makes it clear that it is also okay for businesses to assist consumers in unlocking their phones. I own an online (or offline) business called XXXXX and I have sold hundreds of thousands of unlock codes the last several years. I also sell hundreds of codes every day to hundreds of independent wireless business owners who unlock and flash phones for their customers because they cannot do it their self. This ban on unlocking has had a direct impact on thousands of wireless stores and businesses all over the country who have relied on unlocking phones for their customers not only to earn income, but also to allow their customers access to the service providers they want to use. Without businesses being able to offer this service there is no point in allowing consumers the ability to unlock their own phone. It would take someone who is very technically inclined to even know where to begin. USA consumers would be forced to buy unlock codes from companies out of the USA and would have no local assistance to enter the codes, and no legal recourse should the codes fail. This causes more risk of financial loss to consumers, takes even more money out of our own economy, and causes thousands more people to be unemployed. If cell phone unlocking is legal it should be made legal for both consumers and businesses. Although it was legal before for consumers to unlock their cell phones, it has never technically been legal for businesses to assist them. Please consider my experience when writing this legislation. If there was not a very high demand for consumer assistance by businesses then I would not have had a very successful business since XXXX. Please note this is not a legal advice and for all legal inquries, its BEST to contact a lawyer as we do not provide legal services.